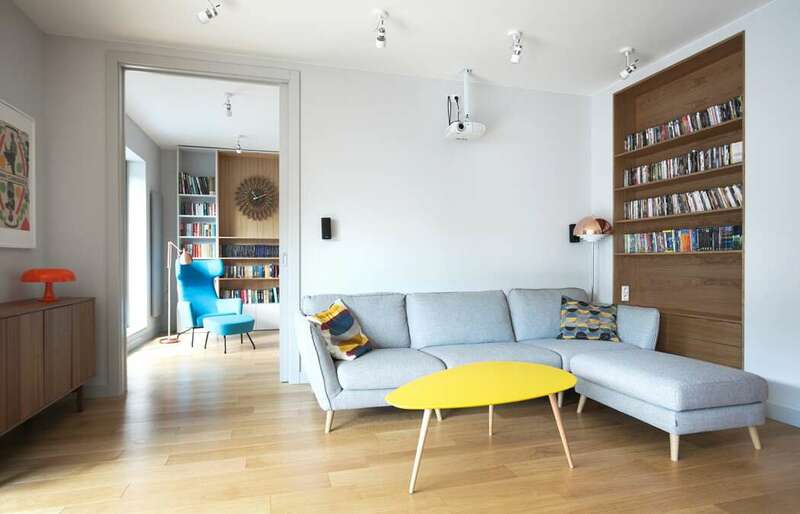 Situated in Warsaw, Poland, this 1,615 sq ft mid-century modern apartment was designed by Soma Architekci. The project of this almost 150 square meter apartment is localized in the the residential area of Ekopark, Warsaw. The clients, a young couple with a two year old daughter, reached out to the interior design studio, Soma Architecki, with a request that they re-design their apartment for their growing family. They were very clear on what they wanted and it didn’t take them long to give the architects the green light on the complete transformation of their apartment. The living area was in deep need of a makeover as it turned out to be a very tight and poorly lit space. Whereas the kitchen was closed, too big and too far from the beautiful windows that definitely seemed to be the highlight of the flat. Firstly, the designers moved the kitchen along with the living area up close to the panoramic windows. Now, whilst drinking their morning coffee or simply when preparing meals, the owners can not only take a minute to look out the windows at the beautiful view of the park outside, but at the same time still have full control of the kids playing in the living room. The previous kitchen area was transformed into a walk-in closet containing a pantry and a spacious laundry room. This space also serves as a buffer allowing kitchen noises to be unheard from the child’s bedroom which is located next door.